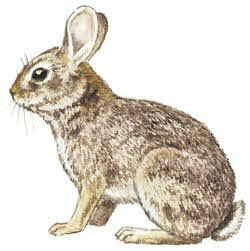 An old name for the rabbit is coney or cony, derived from the Old French conis, from the Latin cuniculus. Farm-raised rabbit has a lean flesh with an ivory color, relatively tender texture and mild, delicate flavor. Average market weight for a young rabbit is 2.2 lb. (1 kg), and for a mature rabbit it is 3-5 lb. Rabbit is a great alternative to chicken – more tender, with more flavor, lean and virtually fat-free. It can be substituted for chicken in most recipes. Cut-up rabbit can be floured and fried just like chicken, braised in wine; or marinated then stewed, as for Hasenpfeffer. The ancient Romans captured wild rabbits, kept them in cages and fattened them for the table.